L-RJames Clow (“Don Kirshner”), Jacob Heimer (“Barry Mann”), Sarah Bockel (“Carole King”) and Alison Whitehurst (“Cynthia Weil”) in Beautiful: The Carole King Musical. Photos provided by The Bushnell. Beautiful: The Carole King Musical makes an encore visit to Hartford’s Bushnell this week, and the well-rendered touring production of the still-hot Broadway musical is well worth the visit for the first or second time. 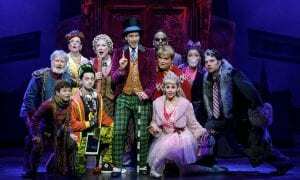 The “juke box” musical has become a Broadway staple–a collection of songs by a composer or artist or musical group, intertwined with a little plot to tie the songs together. Sometimes, they’re fabulous like Jersey Boys, the story of Frankie Valli and The Four Seasons or Mamma Mia! the ABBA tunefest. More often, they’re not. 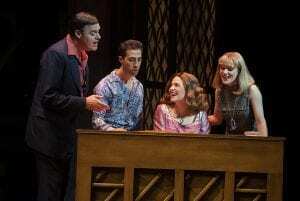 Beautiful: The Carole King Musical, is one on the top of the fabulous list. Carole King established herself as a singer-songwriter with that unforgettable “Tapestry” album, but before she became an icon as a performer, she’d written a cavalcade of hits for other singers. Carnegie Hall. 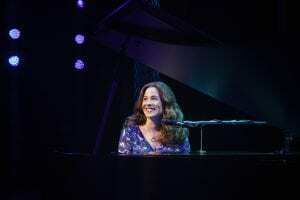 Sarah Bockel as Carole King in Beautiful: The Carole King Musical. Photos provided by The Bushnell. Carole King got her start as a writer of pop tunes with other writers in New York City’s Brill Building. Her rise to stardom as a composer was pretty quick, but her road to international acclaim as a singer/songwriter involved a journey hampered by many hard knocks along the way. She wrote or co-wrote 118 pop hits on the Billboard Hot 100. Most of the songs were familiar to me. I spent many hours as a teen listening to Top 40 tunes on a transistor radio hidden in my prep school dorm bedroom, where that little radio picked up the hot hits from Hartford’s WDRC or Ft. Wayne’s WOWO, which carried after dark to Northern Massachusetts. Marc Bruni’s staging, a recreation of his original Broadway work, is slick and well-timed, and Josh Prince’s choreography.pay homage to the intricate movements which accompanied musical groups like The Drifters and The Shirelles. The stage pulses with excitement when Alexis Tidwell as Little Eva leads the company in Prince’s showstopping “Locomotion”. 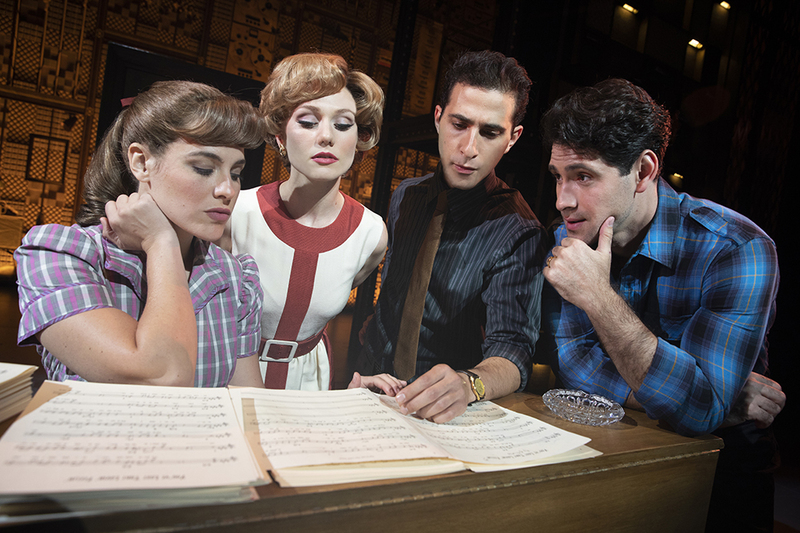 L-R: Sarah Bockel (“Carole King”), Alison Whitehurst (“Cynthia Weil”), Jacob Heimer (“Barry Mann”) and Dylan S. Wallach (“Gerry Goffin”) in Beautiful: The Carole King Musical. Photos provided by The Bushnell. Derek’ McLane’s sets, which run the gamut from concert halls and studios to suburban New Jersey, are great, and Alejo Vietti’s costumes, which mix the offstage and onstage styles of the 1960’s are superb. 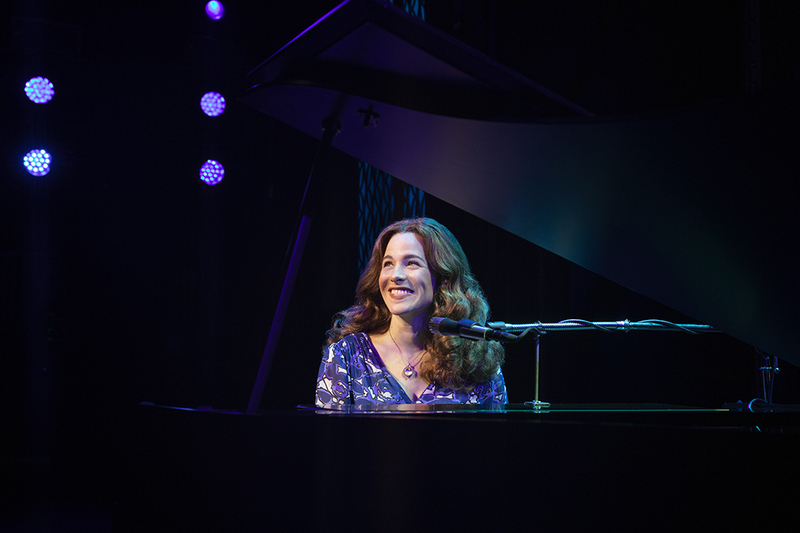 Beautiful: The Carole King Musical opened in San Francisco in 2013, and on Broadway in 2014. On the fifth anniversary of the show’s opening night January 12, 2019, Carole King took to the stage to perform the shows closing number “Beautiful” and the finale of the show. By the way, Sarah Bockel, this production’s Carole King, leaves the tour to assume the role of Carole King in the Broadway production on April 9. Maybe we just saw a new star in the making! The Bushnell presents Beautiful: The Carole King Musical Book by Doug McGrath, Songs by: Gerry Goffin/Carole King and Barry Mann/Cynthia Weil. Directed by Marc Bruni. Musical direction by Jason Howland. . Choreography by Josh Prince. Set design by Derek McLane; Costume Design by Alejo Vietti; Lighting Design by Peter Kaczorowski; Sound Design by Brian Ronan; Cast: Sarah Bockel (Carole King), Dylan S. Wallach (Gerry Goffin), Alison Whitehurst (Cynthia Weil), Jacob Heimer (Barry Mann), James Clow (Don Kirshner), and Suzanne Grodner (Genie Klein). 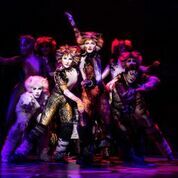 Through March 31 at The Bushnell, Hartford, CT. 860-987-5900 or www.bushnell.org.